I just noticed Tyler Cowen had blogged a Boston Globe article about the number of loanwords in various languages (is there something from the press Cowen will not blog ? ), and his own take was to ask, which major language has the lowest percentage of foreign loanwords ? He seems to think Chinese could be one, but many people in the comments section (correctly) reject the suggestion. Here I talk about “Japanese-made Chinese words”. There are two basic kinds of loanwords amongst languages : the “conventional” one where both the meaning and the form of the word are borrowed simultaneously ; and the other where the meaning is borrowed but the form is “translated” into indigenous roots — or “calque“. In the “conventional” loanword, the borrowing is usually apparent because the original form hasn’t changed too much. English, a world champion importer and exporter of words, contains tens of thousands of Latin and French borrowings whose appearance is only slightly modified, such as guarantee and importance. In more recent borrowings, English hardly bothers even with perfunctory transformation, e.g., tsunami and angst. Likewise, languages like Turkish and Indonesian don’t invent new words for “electromagnetism” ; they only modify the word to reflect the local difference in pronunciation and spelling standards. But in calque languages, the loanwords tend to be invisible. An example is the Russian самолёт (samolyot “self-flight” or airplane), which looks and sounds purely Slavic. Both Russian and German are abundant in calques, but not as much as Arabic, a language which on first appearance seems to lack any foreign loanwords. In fact its abstract vocabulary is heavily borrowed from classical Greek (and later the modern western languages), but the actual words were calqued from Semitic roots. Sometimes the borrowing first took place in Syriac, which lent to Arabic. English and the Romance languages normally do not create calques from indigenous roots, but they still have thousands of “classicising” calques — neologisms built on Greek or Latin roots which were not found in the original languages. Thus microscope is created entirely out of Greek parts, viticulture from Latin, and automobile, a miscegenation of Greek and Latin. Chinese reform leader Kang Youwei 康有為 once said: “I regard the West as a cow, and the Japanese as a farmhand, while I myself sit back and enjoy the food!’” Early Japanese translations made large numbers of important scholarly works and concepts from the West widely available to Chinese audiences; the Chinese felt that Japanese was an “easier” language than Western ones for a Chinese to learn. The Qing court sent increasing numbers of students to Japan – 13,000 in 1906. Between 1902-1904, translations from Japanese accounted for 62.2 per cent of all translations into Chinese. The great majority of these works were themselves translations from English and other Western languages.. But because the Chinese language has its own way of pronouncing Chinese characters that’s different from Japanese, the reborrowed words may sound completely different and many Chinese people may not even know these had been first coined in Japan. Notice the word “philosophy”, which may surprise some people because, after all, wasn’t classical Chinese civilisation full of philosophers ? Yes, but beware of anachronism ! We moderns find the similarity, but East Asians, when first confronted with European philosophy, considered it something quite different from Confucius et al. Basically, a great many modern words in Chinese related to science, technology, government, and commerce, as well as abstract western concepts which may not have had an exact equivalent in East Asia, trace back to late 19th and early 20th century coinages in Japan. An article in a modern Chinese newspaper would be impossible without these Sino-Japanese calques. In some cases, the Japanese went looking in ancient Chinese texts for words with similar but not identical meanings, and resurrected them by giving them modern, western significance. These include : society, capital, revolution, economy, law, science, election, heredity, literature, etc. There are also some pure Japanese words written in Chinese characters that were borrowed. But the “glamour words” are not the extent of it. I was completely surprised to learn that Chinese appears to have borrowed a range of fairly mundane phrases or compounds from Japanese. Some examples include “new products appearance”, “shopping district”, “low birth rate”, and “housekeeping”. The nature of the Chinese character system implies that a new phrase or compound is almost a low-grade invention, because there’s no inevitable way such words must be formed. Japanese used to have a lot of Portuguese and Dutch loanwords as a result of contact with traders starting in the 16th century, but most of those are now obsolete. One major survivor is the Japanese word for bread (パン pan), which is derived from the Portuguese pão. I’m convinced, though I can’t prove it, that the knowledge of the Luso-Japanese word pan was the impetus behind the Chinese translation of “bread” as mian bao (lit. “wheat bun”, simplified 面包 traditional 麵包). 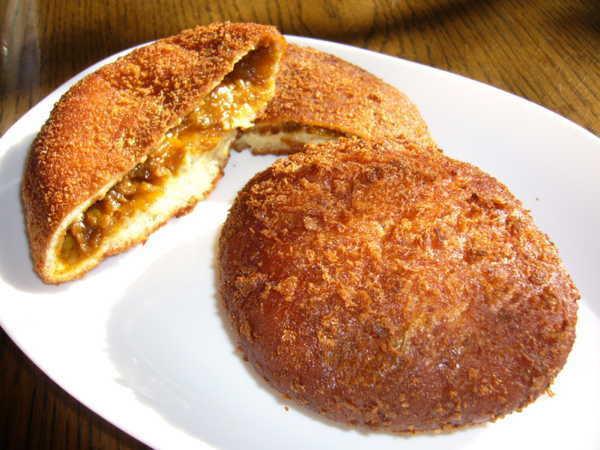 The fact that bao sounds like pan is pure coincidence, and its character has been used in words referring to various kinds of filled buns for a very very long time. But the main reason I believe in the pan-bao connexion is that in some other Chinese languages (e.g., Wu or Shanghainese, and Min Nan or Taiwanese) the second character would be read as pao or pau. Technically, /b/ and /p/ are voiced and unvoiced variants of the same sound. Vietnamese, I believe, also uses a cognate of mian bao, especially in reference to that headcheese-on-baguette sandwich, whose choice might have been influenced by the French pain. I could be completely wrong, but it would be neat if all this were true ! 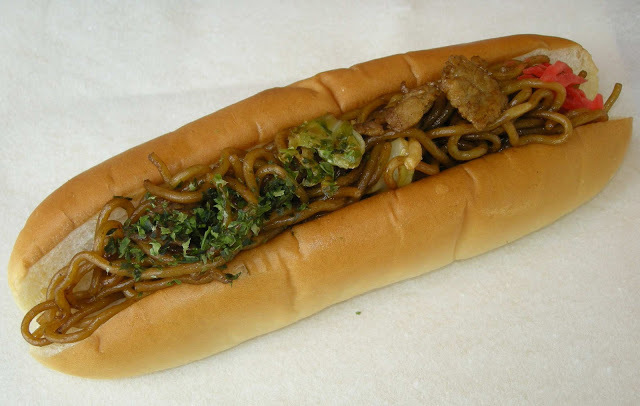 The above is Japan’s answer to both China and the West : fried noodles in a hot dog bun. More specifically, the noodles are yakisoba, itself a very modern interpretation of fried noodles dating from the early 20th century, one of whose principal ingredients is … Worcestershire sauce, or, rather, the Japanese version of it. The green bits are dried seaweed flakes (actually algae, but that’s being pedantic). This alarming combination of starches probably emerged after the war with the American occupation, but I’m not sure. The breadcrumbs are panko, the coarse type preferred by the Japanese which has become inexplicably trendy in many western countries. The British pseudo-Indian “curry” was most likely an import along with many other semi-western dishes that are mainstays of Japanese dining today. The Japanese twist on “curry” is primarily that it’s a roux of starch and palm oil, made from dissolving the semblance of a chocolate bar in water, into which miscellaneous detritus are then introduced. Speaking of both loanwords and food, one Japanese word that’s not European-derived but was coined in response to industrialisation and later imparted to Chinese is ajinomoto (MSG powder ; Japanese 味の素 lit. “principle of taste”, Chinese 味之素). A Japanese scientist early in the 20th century had isolated umami, one of the fundamental tastes, and this was the basis of a major international food corporation, Ajinomoto, the world’s largest supplier of MSG as well as aspartame. Since so much of East Asia’s cuisines are based on exploiting and intensifying the naturally occurring glutamates in their ingredients, Japanese MSG played a major role in Asia’s enormous processed food industry. The history of MSG and its extremely widespread use in global food processing is something I consider a synecdoche of Japanese industrialisation, but that’s a topic for another day. This entry was posted in East Asia, Food, Languages and tagged calques, Chinese, Chinese borrowings from Japanese, Hanzi, Japanese, Japanese-made Chinese words, Kanji, loanwords, wasei kango, 和製漢語. Bookmark the permalink. I like the National Taiwan University paper you linked. There’s a HBD connection to your linguistic post that you might find interesting. The Chinese intellectual Kang Youwei (康有為), who the NTU author mentioned in her paper, and whose colorful phrase about cows and farmhands you highlighted in your blog post, borrowed a particular concept of eugenics (優生學 – “science of superior birth”) from the Japanese which involved the deliberate crossbreeding of Europeans and East Asians to produce a superior blend of Asian. The idea was never popular in either Japan or China, but it was hotly debated among scientists in both countries in the early twentieth century. In China, the debate broke down between the miscegenists (like Kang) and the pure race types (they were most prominently represented in China by this man, Pan Guangdan). The pure-blood side won the debate in Japan. But not without some help from the West. Amazingly, Kaneko Kentarō, an aide of Prime Minister Itō Hirobumi, actually wrote to Herbert Spencer in 1892, requesting his advice on the matter. I suspect Kang and Pan were just aping the debate that had already taken place in Japan. The Chinese intellectuals of that period were hugely influenced by Japan, as Kang’s quote demonstrates. Eugenics was introduced to Japan by Japanese physicians, scientists, and journalists who were familiar with Francis Galton’s Hereditary Genius, which had been translated into Japanese shortly after it was published in England in 1869. Before the neologism yūseigaku (science of superior birth) was coined around the turn of the century, the Japanese referred to eugenics in its romanized form, yuzenikkusu. By the 1930s, these two terms were often used interchangeably with minzoku eisei, or “race hygiene,” after the German Rassenhygiene, which, in turn, were used synonymously with two older expressions, minzoku/jinshu kairyō (race betterment) and minzoku/jinshu eisei (race hygiene). Minzoku and jinshu, the two Japanese words for “race” in both the social and phenotypical senses, for the most part were used interchangeably, although jinshu remains the more clinical, social-scientific term (cf. Rasse) and minzoku the more popular and populist term (cf. Volk). When prefixed with names, such as Nippon and Yamato, the latter an ancient and nationalistic appellation for Japan, minzoku signified the conflation of phenotype, geography, culture, spirit, history, and nationhood. All of these semantic and semiotic inventions were part of the ideological agenda of the Meiji Restoration (1868) and were incorporated into the postwar (and current) constitution of 1947, which retained the definition of nationality and citizenship as a matter of blood, or jus sanguinus (as opposed to citizenship determined by place of birth, or jus solis). Sorry I can’t provide the actual Japanese rather than the romanized version of the Japanese that the author provides in the source, although I imagine it should be pretty easy for someone who knows Japanese. Unfortunately, the chapter on China and Hong Kong doesn’t attempt to trace out the same linguistic history of how eugenics and race was handled in the Chinese language. Actually both comments are right on target. This blogpost (as implied by the kanji title 大東亞共現代性圏 or Greater East Asian Co-Modernity Sphere) is about the Japanese mediation of East Asian modernity, seen through the loanwords. Plus I added the “bakery model” comments along the same theme. Also I was going to segue (from food) into East Asian imitations of the Japanese “trading company procurement” model…. 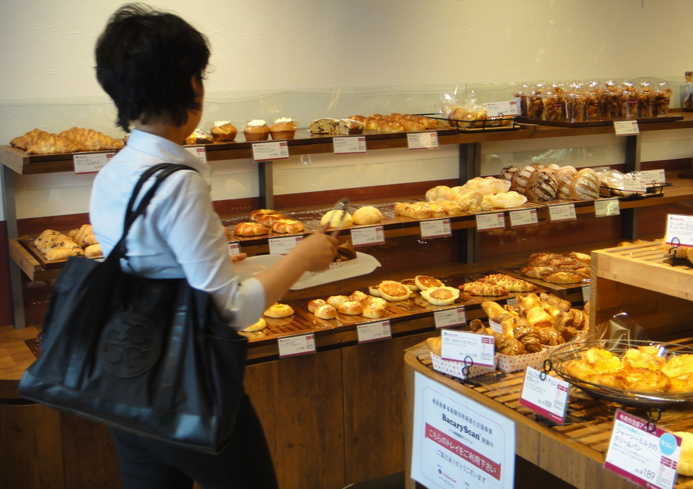 One reason both breads and pastries at Asian bakeries taste somewhat different than what one might expect, is they all use flour that’s not used in western countries. Though famed as a rice-consuming country, Japan alternates between 5th and 6th place on the rank of the biggest importers of wheat in the world. Japanese demand for flour with very particular characteristics is so high that a new variety of wheat, U.S. western white, was specially developed for that market. Japanese consumption is big enough that fluctuations in demand can cause a mini-crisis in the wheat industry. The mass international importation of wheat is organised by a handful of Japanese multinational corporations with no parallel outside East Asia : the trading company, or sogo shosha. Of course companies which specialise in buying and selling, importing and exporting, are dime a dozen in the world, but they are usually small companies based on individuals or close-knit families. The famous hongs of British Hong Kong long ago stopped being merchant houses and have become diversified holding companies that mostly own properties. There are not that many trading companies or “merchant houses” that have billions of dollars in annual revenues. Here’s a list of the world’s largest trading companies. The four non-Asian companies listed are all specialised distributors in pretty specific products, not really trading houses like Mitsubishi, Sumitomo, Mitsui, or Marubeni. Those Japanese trading companies buy nearly everything Japan imports and markets them to processors and distributors in Japan. Cattle, wheat and soybeans from the United States ; fertilisers, solvents and shrimp from China (many manufactured by Japanese corporations located in China) ; timber, ash and steel from Brazil ; oil, metals and minerals from Russia ; and algae harvested along huge stretches of the East African coast — these generally go through Japan’s trading companies. South Korea is also well represented on that list, which is my point : either the Koreans have imitated the Japanese procurement model, or some common cultural characteristics have driven them into a similar system of global distribution. China is also doing it. If you want to import ball bearings from China, and you google for suppliers, chances are you will find dozens upon dozens of Chinese suppliers complete with amateurish websites packed with a surfeit of details, convenient contact information and allegedly English-speaking reps with friendly names like Julie or David. The vast majority of them are agents located in a smaller city like, say, Taizhou (Zheijiang province) but representing some company which actually makes the product none of whose owners or employees speak a word of English. That model of procurement by representative agent, the Chinese are now reproducing on a global scale — but first in Africa. Are 土人 and 原住民 also made-in-Japan words ? Both mean “indigenous” or “aboriginal”, except 土人 is considered old-fashioned and vaguely offensive (lit. soil or earth person) whereas 原住民 is quite bland. I’m not sure offhand about the derivation of either word, but I wouldn’t be surprised if your speculation was correct. I didn’t even realize until today that the stock greeting (歡迎光臨 !) used at so many Taiwanese establishments to welcome customers into the store was adopted from a Japanese phrase (irasshiaimase). The most common word for ‘bread’ in Taiwanese Hokkien is pháng, which is a direct loan from Japanese. I doubt 土人 is a Japanese invention since the usage appeared in early Qing and also Ming official documents. Now 土著，that’s possible. 原住民is Most definitely a modern term, no Qing official worth his ink would be caught dead with such phrasing. Bread is ‘bánh mì’ (wheat “bánh”) in Vietnamese where bánh is actually NOT from French ‘pain’ but rather from Sino-Vietnamese ‘bính’ (餅) referring to a wide range of baked snacks, cakes, pastries and other food that can be either sweet or savoury. -anh and -inh are sometimes used interchangeably (the former is more of a southern thing… eg. sanh/sinh = to be born). I did not suggest that the word came from French. I merely speculated whether the similarity of the sound suggested its use in denoting Western bread. For bread, the Chinese basically went with a compound of wheat + 包, which had been traditionally used in other compounds denoting various kinds of filled buns. According to you the Vietnamese settled on 餅 as the defining character. But in both Chinese and Japanese 餅 is also used in compounds to refer to a variety of concoctions made from one kind of batter or another (“pancakes”, “cakes”, mochi, etc.). If that’s the case, it’s quite a phono-semantic coincidence that these two different characters are today involved, in different languages, with the word “bread”. Do not forget that many “Chinese” words are loan words from other Chinese languages, for example from Cantonese to Mandarin. The circle has many times been completed when Japan has borrowed 17th century Cantonese words to which were then reused by Mandarin officials in Peking or Manchuria. Some words that came into Mandarin through trading contact with the Europeans in Canton, makes no sense in Mandarin but sounds quite good in Japanese. In other words, some Japanese borrowings from China came via Cantonese and not Mandarin. PE, this was a great post. I wish I had something erudite to offer. The general proposition, I think, is that Westerners, particularly half-educated Americans, tend to think that speaking a language establishes their expertise and authority concerning languages. Thank you. I put in an edit to reflect the correction.